The anniversary of Roald Dahl's birthday is being widely celebrated throughout the world as Roald Dahl Day. 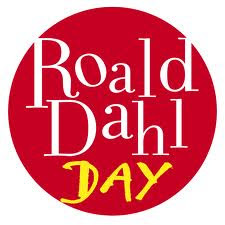 The Roald Dahl Day website has lots of printable materials to plan a party at home or school. There is also Reading Relay Competition. This month, Storyteller: The Authorized Biography of Roald Dahl by Donald Sturrock was released. The book release prompted many book reviews (The Independent, UK Telegraph, The Guardian) and commentaries about Roald Dahl's life (New Yorker, UK Telegraph). By reading these articles you will learn that Dahl's life was full of many twists and turns. These stressful and tragic life events most likely helped shape the mind of one of the most recognizable names in children's literature. I was fascinated to learn of Roald Dahl's "writing hut", a small shed in his garden where his most favorite stories were written. The Roald Dahl Museum allows you to virtually explore the hut. The Walrus and the Carpenter blog provides a few good pictures and some commentary. I think I need my own "writing hut"! Our family just finished reading, Charlie and the Great Glass Elevator which is the sequel to Charlie and the Chocolate Factory. This was the fourth Roald Dahl book that I have read to my daughter. We also read James and the Giant Peach and The Twits. When we read Charlie and the Chocolate Factory and James and the Giant Peach we also watched the movies. We read up to a certain point and then watched that part of the movie. We would continue reading the book then watching the movie until both were complete. I feel this helped with her comprehension of the stories. It was also fun to discuss the differences between the movie and book. I know my dad reads my blog, which I appreciate very much. I have found an activity for him to celebrate Roald Dahl's birthday. My dad is a big James Bond fan and Roald Dahl wrote the screenplay for You Only Live Twice. For those of you who are not James Bond fans, Dahl also contributed on the screen play of Chitty Chitty Bang Bang. He also had some of his short stories featured on Alfred Hitchcock and Tales of the Unexpected. Happy Roald Dahl Day! Wear Yellow today as it was Dahl's favorite color! 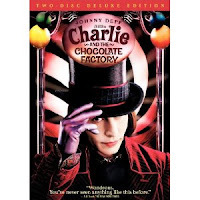 I loved willy wonka when I was a child. I grew up very poor. One day, as a teenager I was walking home from school. It was quite a long walk, about 3.5 miles, and very icy and snowy. I cut across the parking lot to save time. I looked down and there was a 5 dollar bill half frozen in the ice. My very first thought was of charlie and how he felt finding that money.